I’ve had this tar-tah-ta before. 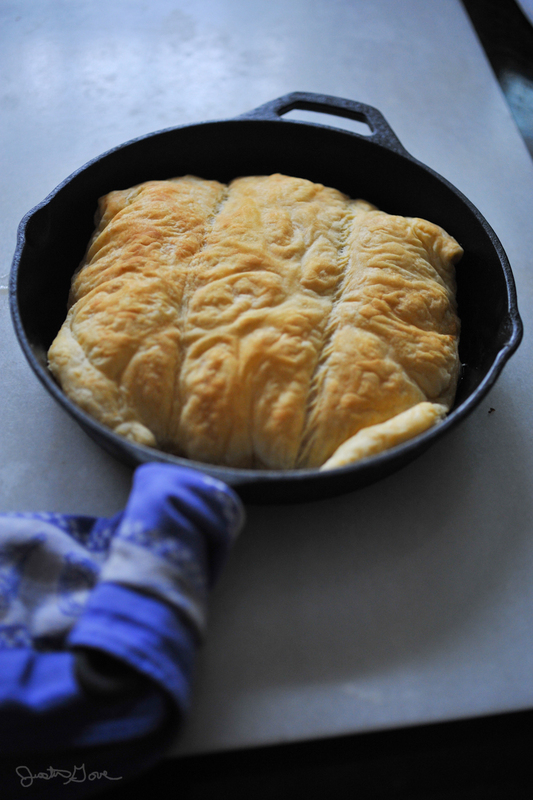 It involves butter, apples, sugar, puff pastry, and a cast iron skillet. The idea is to caramelize the apples on the stovetop before tucking them cozily beneath a puff pastry blanket, and baking. With the puff pastry serving as a delicious, edible lid, juice from the sealed-in apples steams and mixes with the butterscotch thus basting the fruit as it cooks. Once it is done a plate is placed atop the pan, flipped, and voila! A lovely, browned apple tart. It may not be traditional breakfast fare, but in my book it’s one step away from being an apple strudel or fruit-filled croissant. Never mind that we have a pint of toasted coconut Gelato Fiasco in the freezer that I know we’re all assuming will make its way into this morning’s special breakfast. While we wait I enjoy another cup of coffee and hit the internet to find out more about this tart-tah-tan, including how to spell it. The first Tarte Tatin, I learn, was constructed in central France around the turn of the 19th in an effort to save a batch of cooking apples from burning atop the stove. 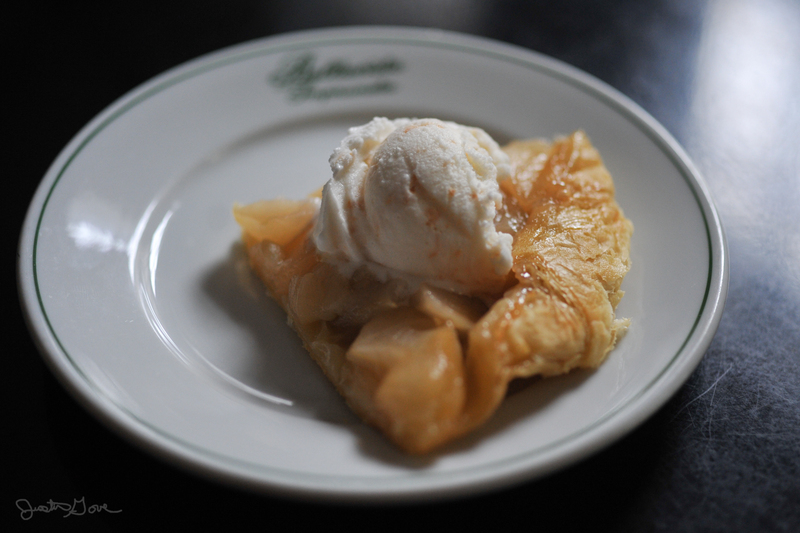 Thinking quickly, Stéphanie Tatin, its originator, tossed a pie dough over the apples and, well, you know the rest. The dessert was a hit, and the hotel Stéphanie ran with her sister became famous for it. So famous, in fact, it is rumored that a chef from Maxim’s went undercover as a Hotel Tatin gardener and absconded the recipe back to Paris where it became a staple on their famed menu. The simplicity of Tarte Tatin pleases me. It is one of those rare dishes of interpretation – while there seems to be some debate as to whether it should be prepared with sugar and butter or just sugar, pastry dough or puff pastry, and many appear to have firm positions on the intricacy of its preparation, the bottom line is this: a French lady saved some burning apples by creating an upside-down pie. The “disaster-averted” nature of the dish indicates to me that each chef should do as s/he pleases. How many apples? Well that depends on how many you have and how many you’d like to use. Does it take a lot of sugar? Only if you want it to. This is cooking at its best, and why Tarte Tatin is so recommendable for the fall months in Maine. Because let’s face it, who doesn’t pick too many apples when the sky, the air, and apples are all so crisp and perfect? Then by the time November hits, we’re all looking for something unique (but simple) to do with them. That said, I do have a soft spot in my heart for the brotherhood of Lichonneux, in their impressive costumes and enthronement ceremonies, who insist that there is one, and only one, proper way to prepare a Tarte Tatin (which they are kind enough to offer on their website). They take their Tarte seriously, and I agree with their proclaimation: “You are absolutely right: Tarte Tatin is terribly tempting! 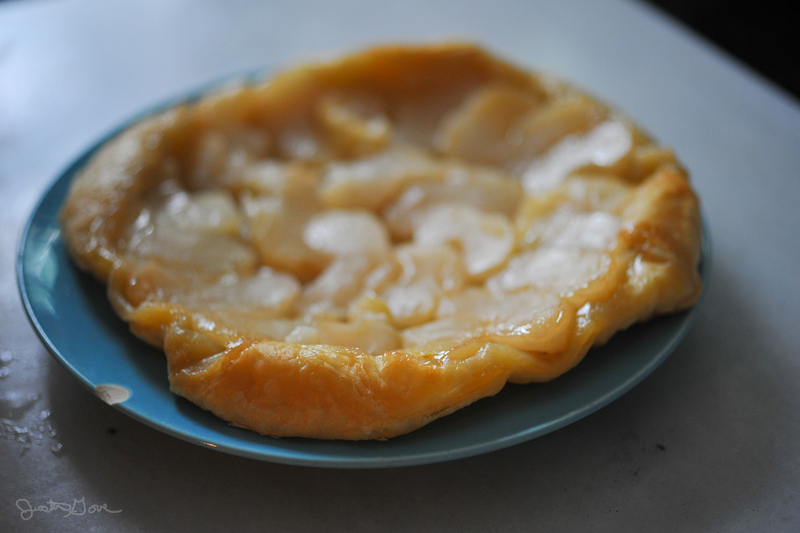 Tempting in its beauty, things that are simple and true: after all, an apple can take you to paradise.” But I’ll get back to this fascinating French tribe in a minute – for now I have to indulge in my very own Maine apple Tarte Tatin, which has just appeared like a mirage beside me. Serve it with a Chilled Vouv-ray! Our friend Nicholas’ Tarte Tatin truly passes as breakfast fare. He has gone light on the sugar, which means that traditionalists (the Lichonneux) might think it’s not really a Tarte Tatin after all. It seems that the caramel is what everyone is after. I consult Julia Child. An episode of her “The French Chef” from 1971 is available online through PBS, and it is amazing. For me the highlight is when she expertly yields a smooth and unblemished pie dough by barely touching it and then beating it with a broom handle her husband fashioned into a rolling pin. The low point? A disappointing looking Tarte Tatin. Now, I give it to Julia that this 30-minute episode appears to have been produced without cuts, her commentary is interesting, and she undertakes the traditional method of preparation. But the bottom line is that her tarte slides all over the place and the apples look eerily like a plate of aged oysters. All three of us shift uncomfortably, not wanting to admit that Julia Child could have produced something so offensive looking. As she festively suggests serving it with a chilled Vouvray and a bit of French crème du pot, I nervously think to myself, trompe l’oeil (because, of course I am now calling on all of the French phrases I know). Trick of the eye – must be that old ‘70s footage. I’m sure it was delicious. I go back to the Lichonneux. These are the people of Lamotte-Beuyron, France who, “by birth or by choice, are particularly tired of seeing very ordinary apple tarts or tarts made with other fruit served under the attractive name of Tarte Tatin.” I suppose they would loathe the Tarte Tatin we have just eaten here in Portland, Maine. But no matter, I have a deep respect for a people who would form a club and a costume devoted to a local fruit dessert. Why not me? I might start my own chapter, right here in Maine. The traditional garb might not make the final cut. Of course I’d have to give up the notion that this is a recipe of interpretation, and that I’m not sure I can do. I’m just not that much of a perfectionist when it comes to cooking. And we have too many apples to eat.